We already know that the positioning provided has an error, usually in the range of 4 to 10 meters. That's about space, but what about time? By using Torque we can estimate it. Torque log files contains GPS coordinates and the speed calculated from GPS readings: we can try to relate it to the speed reading from OBD, that is instantaneous, while the GPS speed is subjected to the delay induced by the GPS itself. 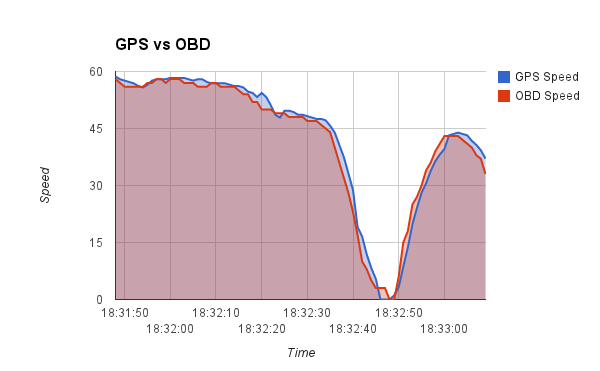 From the chart, we can say that the OBD speed is accurate, but the GPS value is delayed by an interval between 1 and 2 seconds.